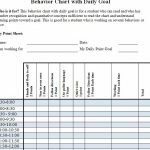 The Task Tracker Template is a spreadsheet designed to help you plan and accomplish any goal you have in mind. 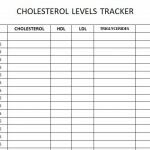 The Tracker Template is a great tool for anyone to plan and finally achieve long-standing goals and even short ones that have eluded you. Everyone has a goal they want to achieve, whether it’s finishing a novel or losing some weight to get into better shape, this template breaks down that goal into separate tasks. You may not think reading a 300 page novel in a day is possible but breaking down your tasks into smaller sections, you’ll find reading 25 pages an hour is a lot easier, making your ultimate goal seem easier. It will work the same with another goal as well. Accomplish anything you set your mind to with the Task Tracker sheet. 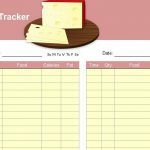 After downloading the free Task Tracker file to your computer, open the document to start customizing your very own tracker sheet. At the top of the page (below the picture) you will enter the current date. Each table represents exactly one week from the last table. You can see from the example that the goals of this person are to eat healthily and exercise a certain number of times over the week. You will go through and change these to your own specific tasks. Start by naming your task in the first column, followed by the number of times you want to accomplish this goal in a week. 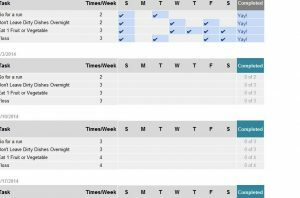 You can then use the weekly calendar to mark the specific days you have completed your task. 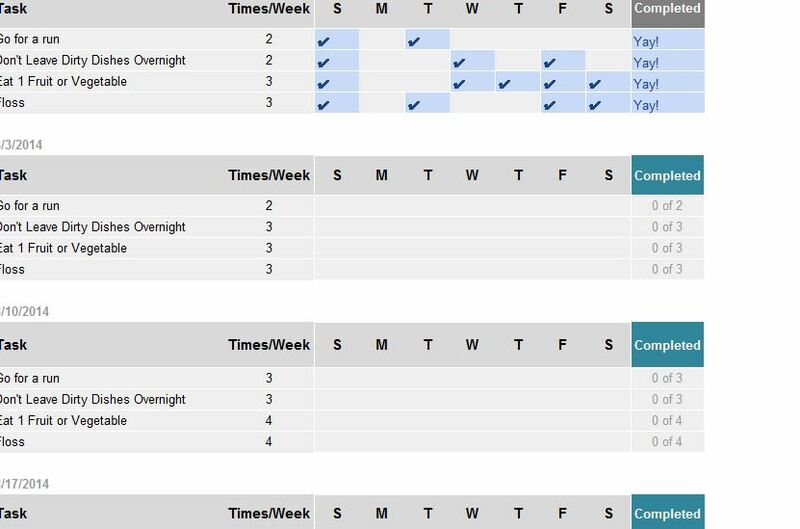 When you’ve completed a task, the “Completed” column will automatically congratulate your with a “Yay!” in the final column. Once you’re ready to move on to the next month, just rinse and repeat to the next table and enter the date for the new week. Even large goals aren’t so challenging when you break them down this way. This is why the Tracker Template sheet’s structure is unrivaled and you can’t beat a price tag of free either.